ST. LOUIS (Nov. 14, 2018) – Ameren Missouri wants to warn its customers about thieves using new, more sophisticated tactics to imitate utility companies. 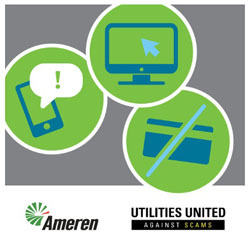 For the third consecutive year, Ameren Missouri is partnering with 100 other electric, water and natural gas companies through the Utilities United Against Scams (UUAS) collaboration group to mark today as Utility Scam Awareness Day. Ameren and UUAS members work together to raise awareness of scams and educate consumers before they become victims. Scammers typically use phone, in-person, and online tactics to target these customers. Posing as electric, water, or natural gas company employees, scammers threaten that customers’ services will be disconnected or shut off if they fail to make an immediate payment – typically using a prepaid card or other non-traceable form of payment. They also often mask incoming calls as coming from the utility company on caller ID systems, and then give a different phone number to make a payment. "The best way to combat scams is to know what tactics criminals use to dupe customers into giving up personal information," said Maria Gomez, Ameren security supervisor. "With the holidays approaching, scammers will be more aggressive in their attempt to steal from unknowing victims. Today is a good reminder for all of us to remain vigilant when encountering suspicious activity involving threats or immediate payment." “Electric, water, and natural gas services are vital to our everyday lives, and scammers are continually attempting to take advantage of utility customers,” said Sheri Givens, UUAS executive director and former state utility consumer advocate. “UUAS will continue to help spread awareness of malicious and frequently evolving tactics that scammers use to target customers." Equipment or repair bogus fee: Scammers may call demanding a separate payment to replace or install a utility-related device or meter. Overpayment trick: When scammers call claiming you have overpaid your utility bill, and you need to provide personal bank account information or a credit card number to facilitate a refund. Power restoration rip off: Scammers may call offering to restore power quickly or in a preferential order for immediate payment typically in the aftermath of a severe storm causing widespread power outages. Never give your credit card, debit card, Social Security, ATM, checking or saving account numbers to anyone who calls, sends an email, or comes to your home requesting this information. Don't trust anyone asking for immediate payment. If you suspect someone is impersonating an Ameren employee, end the conversation and immediately call Ameren Illinois at 1.800.755.5000 or Ameren Missouri at 1.800.552.7583. Never purchase a prepaid card to avoid service disconnection or shutoff. Legitimate utility companies do not specify how customers should make a bill payment and always offer a variety of ways to pay a bill. Ameren customers can make payments online, by phone, electronic check, mail or at pay in person locations. For more information, visit Ameren.com/stop-scams. Customers should also follow Ameren on social media to receive the latest updates on scams. Utilities United Against Scams (UUAS) is a consortium of more than 100 U.S. and Canadian electric, water, and natural gas utilities (and their respective trade associations). UUAS is dedicated to combating impostor utility scams by providing a forum for utilities and trade associations to share data and best practices, in addition to working together to implement initiatives to inform and protect customers. Visit www.utilitiesunited.org for more information and tips about how customers can protect themselves from impostor utility scams or follow along on social media: Twitter @U_U_A_S and Facebook @UtilitiesUnited.